Say Happy Birthday with Code! Most people just say “Happy Birthday” to each other over social networks like Facebook and Twitter with the same 14 predictable letters. Why not say it with code? If you’re a developer you already understand. Before you ask … Yes, I really did write and run the QBasic 4.5 version in 16-bit mode running www.DosBox.com on Windows 7 x64. Oh, and no it’s not my birthday. 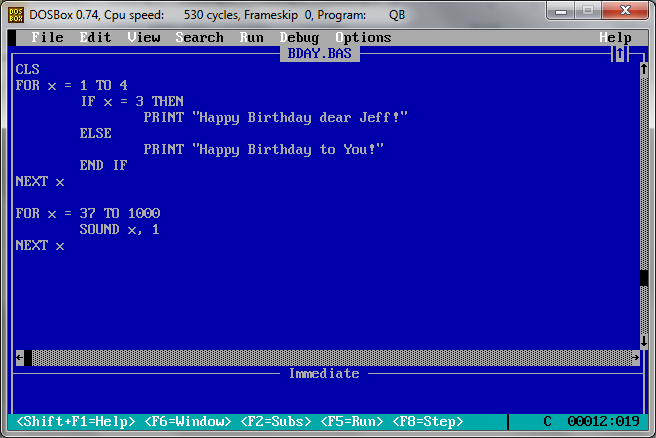 IF %%A == 1 ECHO "Happy Birthday to You!" 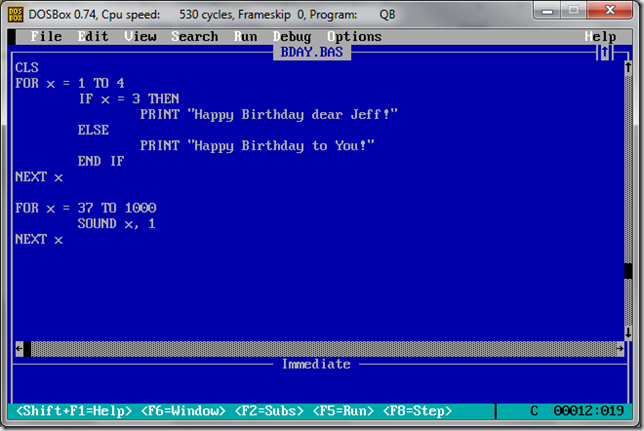 IF %%A == 2 ECHO "Happy Birthday dear Jeff"
PRINT "Happy Birthday dear Jeff!" PRINT "Happy Birthday to You!" 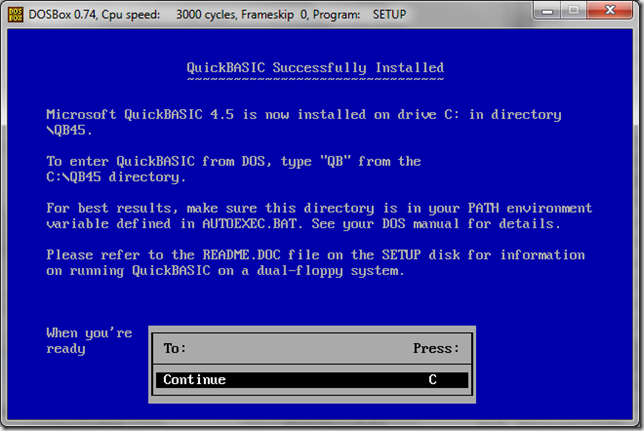 I recently saw this error while patching SharePoint with a Cumulative Update. Most people will never see this. However, you are not most people. You run Visual Studio. 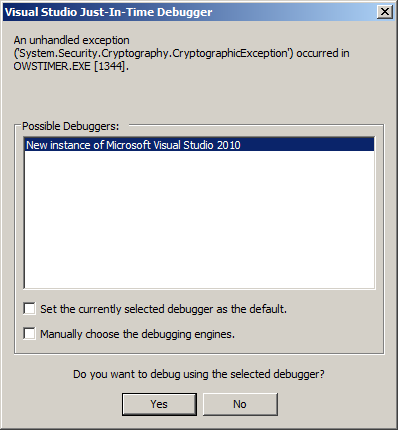 Visual Studio is trying to help us out with an unhandled exception by asking about launching debug. 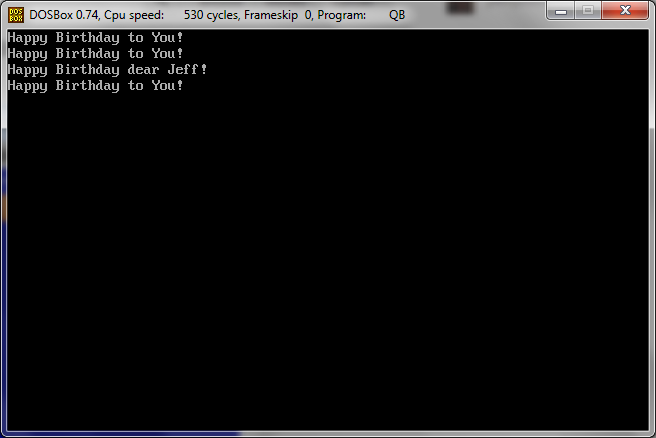 That’s all well and good but I didn’t write the code and have no plans to change it. 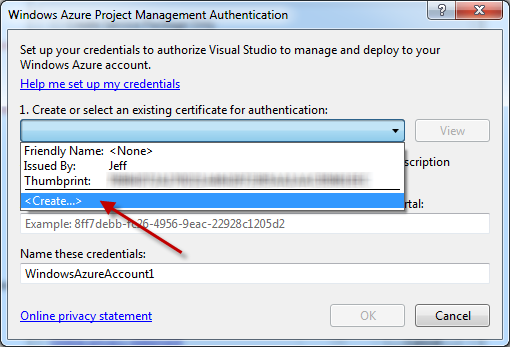 The more I learn about Visual Studio 2010 the more I like it. For SharePoint developers, it is great to finally have a mature toolset. To make that experience even better the community has created several VSIX extensions as a “quick start” to more easily jump into various project types. Below I outline links to the VSIX extensions I am aware of and run locally. If you have any questions or suggestions please leave a comment. Cheers! 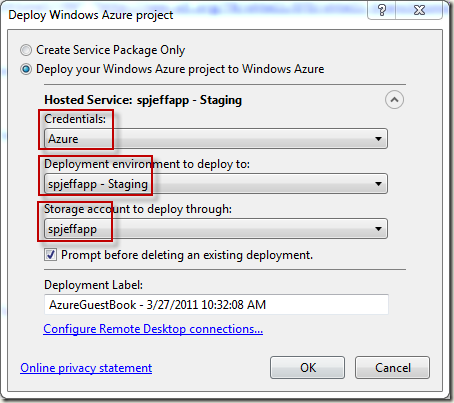 Today I deployed my first Azure application and documented the step-by-step process with detailed screenshots. 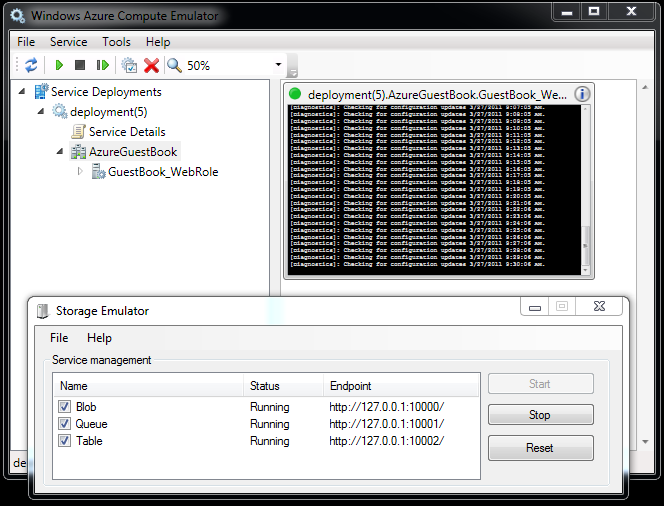 First I downloaded the Azure SDK and prepared Visual Studio 2010. Azure is a cool idea because of the support for highly scalable custom code. 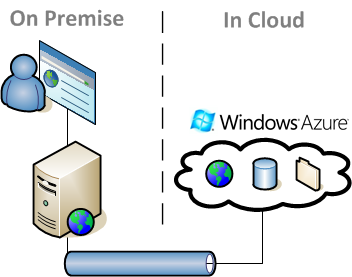 One frequent objection to cloud hosting is the basic functionally. Cloud providers tend to offer what’s easy and convenient … while avoiding custom code. Hybrid models may be the resolution. Architects who can connect multiple vendors seamlessly or blend on-premise with in-cloud servers will be in demand. We begin with the "Guest Book” sample application which allows you to post messages on a common wall with a picture attached. Simple enough. 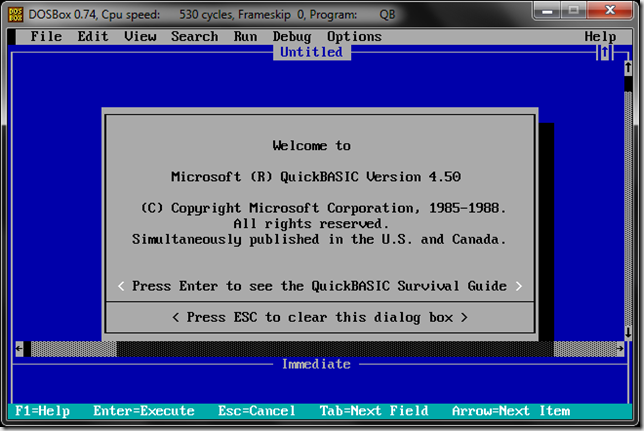 Here you can see the tray Azure Emulator running the website locally on my laptop. For development you want to run things locally, test, and deploy to the cloud when stable. Right clicking on the tray icon allows you to view Emulator status, logs, and details. You can restart and control instances here. Out of curiosity I opened SQL Management Studio and viewed the “SQLEXPRESS” instance (which the default for the Azure SDK examples). 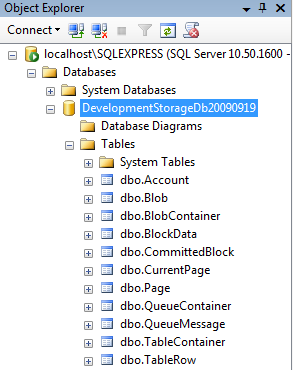 Here you can see the databases and tables this sample created. The schema appears very abstracted. 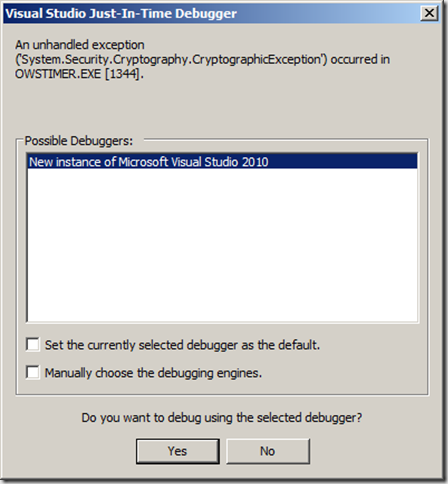 From Visual Studio 2010 all I saw were strongly typed Classes and Objects for data. 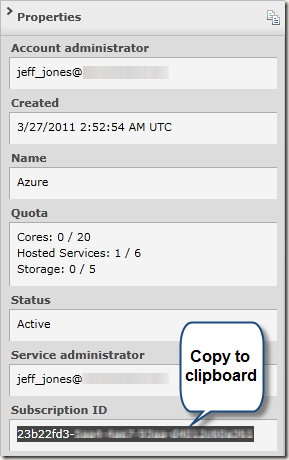 Somehow that is being flattened to a database table using the Azure binaries, pretty cool. 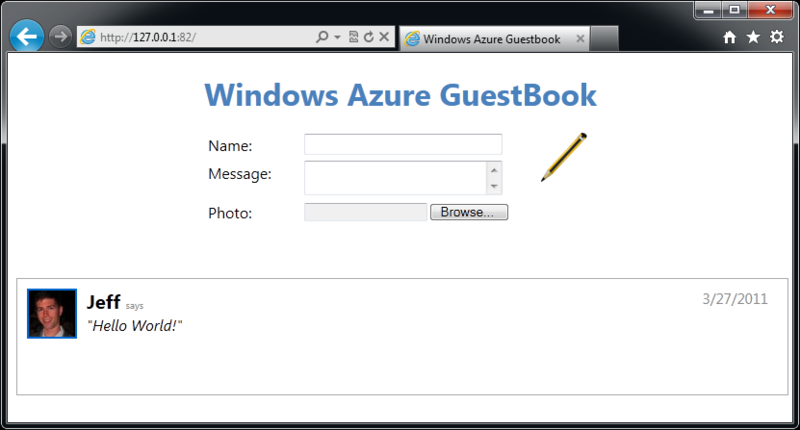 Here is the Visual Studio 2010 Solution Explorer showing the 3 projects and related files inside of the “Guest Book” sample application. OK, let’s get to the fun part. 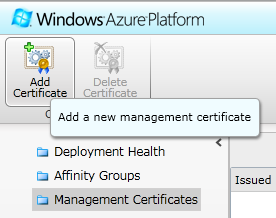 Open a web browser, navigate to https://manage.windowsazure.com/ and login to Windows Azure Platform Management. There is some new vocabulary which be confusing at first. 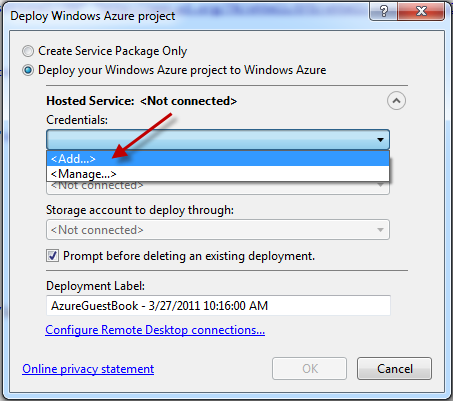 First, create a new “Hosted Service. This can take 5-10 minutes to provision so be patient. 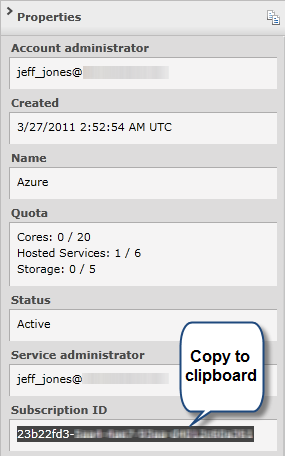 Once the “Hosted Service” shows “Created” then we must add a “Storage Account” for the ability to hold data in the cloud. 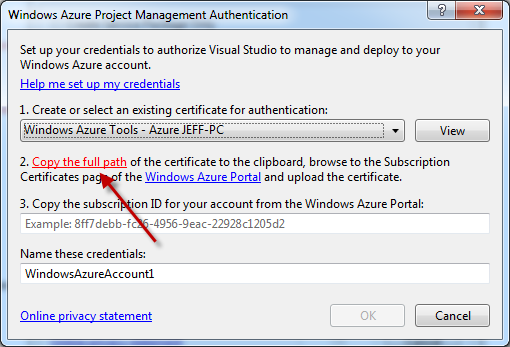 Certificate trusting the local laptop’s Visual Studio 2010 to publish. This is a LOT of work, but only a one time operation. Let’s get started. 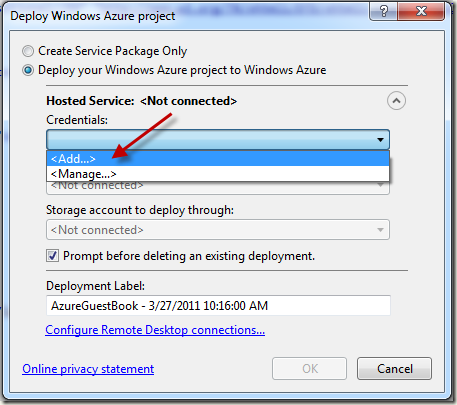 Right click on your Azure project within the solution explorer and click Publish. The first time here we need to Add Credentials. Click “copy the full path” to populate the clipboard with the local file path. We’re going to leave Visual Studio 2010 for a minute, but keep it open in the background since we’ll be back. 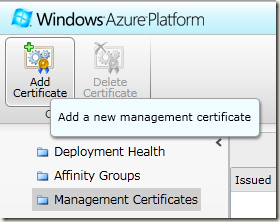 In the web browser go back to Windows Azure Platform Management. 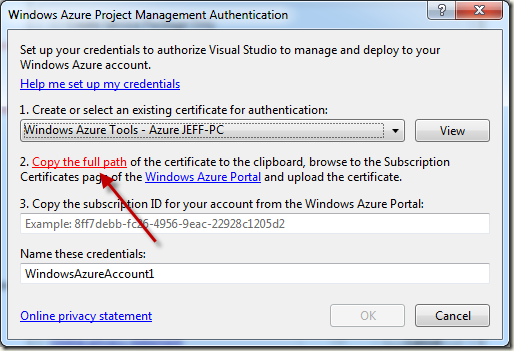 Click “add certificate” and paste the local .CER file path from the previous setup. Click on the “Subscription” line item to view the “Subscript ID” number. Copy this to the clipboard. 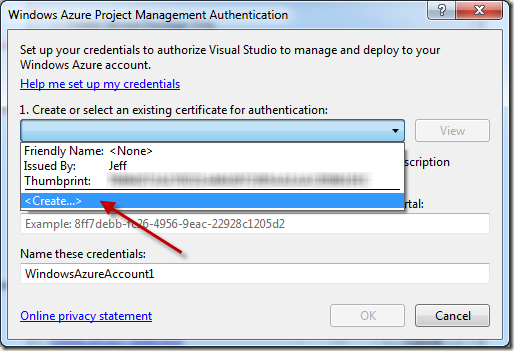 You will need to give that to Visual Studio 2010 locally for publishing. 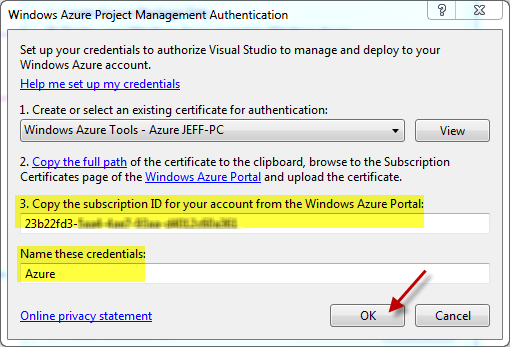 Back in Visual Studio 2010 we need to finish the Add dialog by giving it two values: Subscription ID and Name. 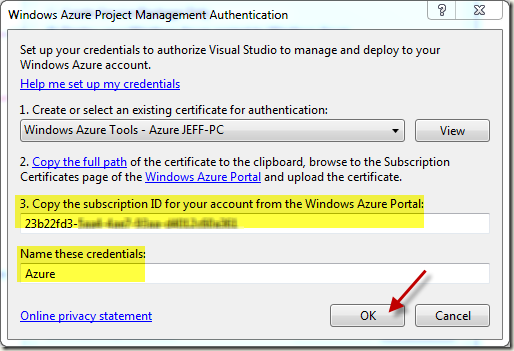 You’ve successfully connected your local Visual Studio 2010 to the Azure Subscription. 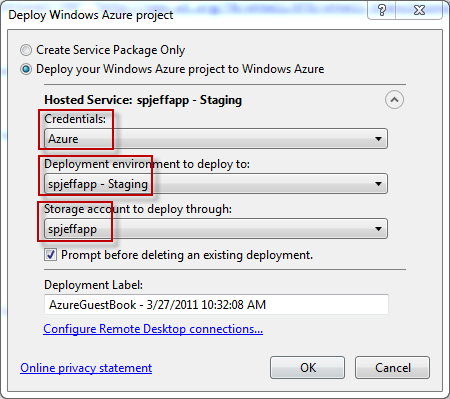 You should now see three cascading drop down menus with the Azure cloud deployment destinations.